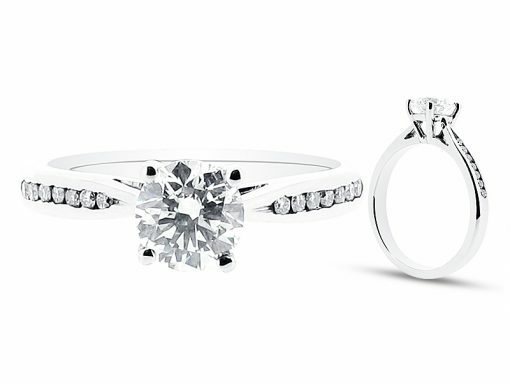 This contemporary twist on a classic style comprises of a round cut centre stone with channel set shoulders. Channel set diamonds are not held with claws but with the tension of the metal either side. The effect is clean, defined lines for a very uncluttered look. This ring can be made for budgets starting from approximately 1,500 euro, and can be set into 18k yellow, rose, and white gold, and platinum. Voltaire Diamonds have a wide selection of diamonds available with diamond grading reports from GIA, IGI, and HRD. We would be delighted to meet with you at our offices just off Grafton Street.